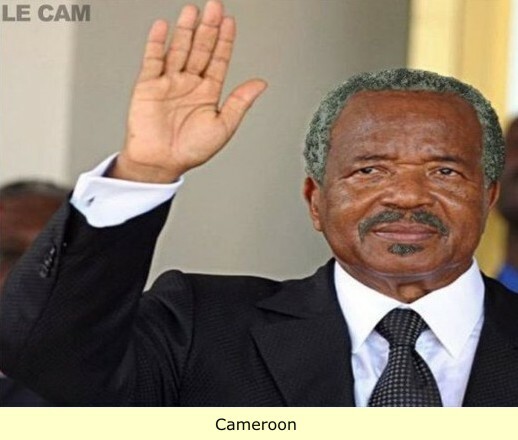 The Cetic-like people (R1b DNA) of north Cameroon? 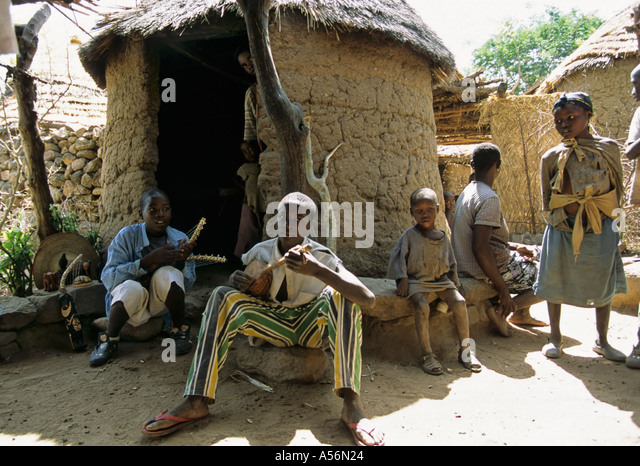 → The Cetic-like people (R1b DNA) of north Cameroon? R1b1 (P25) people might have been among the first people to domesticate cattle in eastern Anatolia and northern Mesopotamia/Syria during the Pre-Pottery Neolithic period.... the V88 branch migrated south to the Levant, then to Africa, following the Nile Valley until the Sahel, then spreading westward. Although human Y chromosomes belonging to haplogroup R1b are quite rare in Africa, being found mainly in Asia and Europe, a group of chromosomes within the paragroup R-P25* are found concentrated in the central-western part of the African continent, where they can be detected at frequencies as high as 95%. Phylogenetic evidence and coalescence time estimates suggest that R-P25* chromosomes (or their phylogenetic ancestor) may have been carried to Africa by an Asia-to-Africa back migration in prehistoric times. 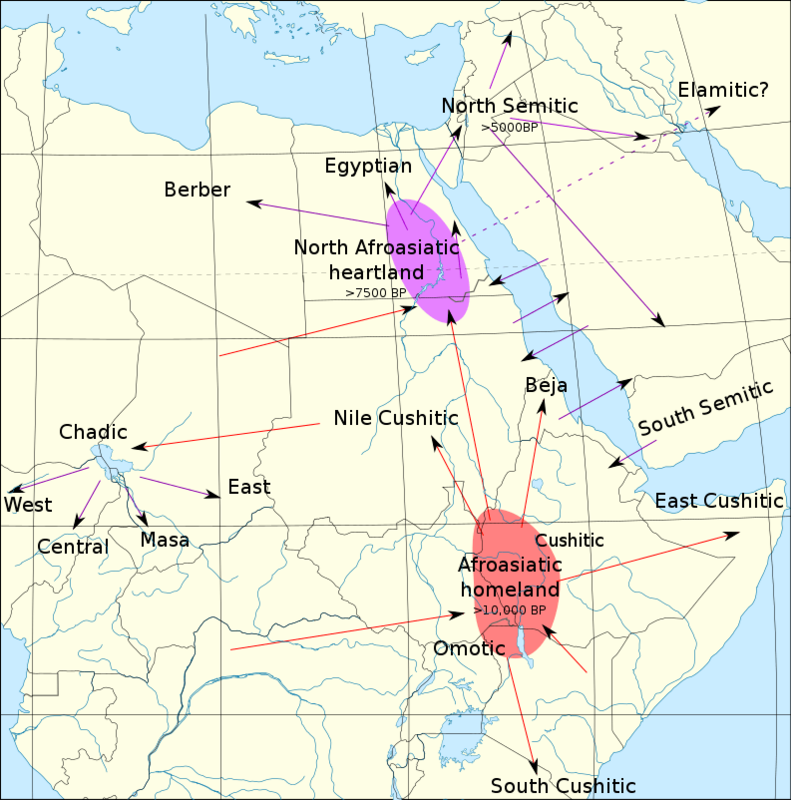 The analysis of the distribution of the R-V88 haplogroup in >1800 males from 69 African populations revealed a striking genetic contiguity between the Chadic-speaking peoples from the central Sahel and several other Afroasiatic-speaking groups from North Africa. The R-V88 coalescence time was estimated at 9200–5600 kya, in the early mid Holocene. We suggest that R-V88 is a paternal genetic record of the proposed mid-Holocene migration of proto-Chadic Afroasiatic speakers through the Central Sahara into the Lake Chad Basin, and geomorphological evidence is consistent with this view. That's 3000-8000 BC. 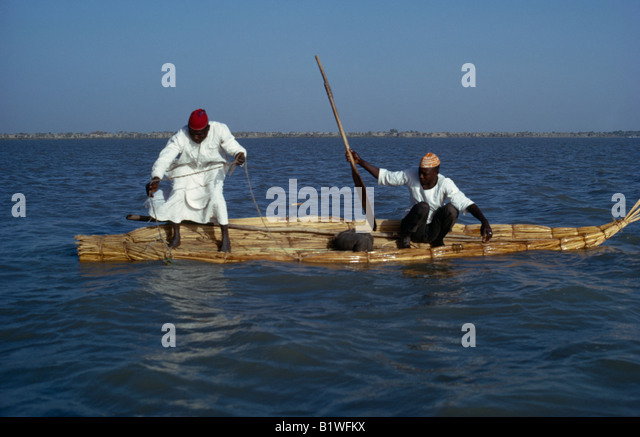 They moved to Lake Chad. It is noteworthy that the Fang population is the Bantu agriculturalist group presenting the highest frequency of R1b1*. The presence of the Fang in west Central Africa appears to be recent and they 20 are thought to have entered the region from the north-eastern open grassland plateau during the 17th and 18th centuries (Perrois 2006). R1b1c is found in northern Cameroon in west central Africa at a very high frequency, where it is considered to be caused by a pre-Islamic movement of people from Eurasia. Quote: But, how did T and R1b end up in Northern Cameroon in the first place where they are outliers? Here is a plausible story. Northern Cameroon is where you get dumped if you follow the White Nile to its source and then hop over a very low mountain range to the next river system over which is one or two more days journey on foot. 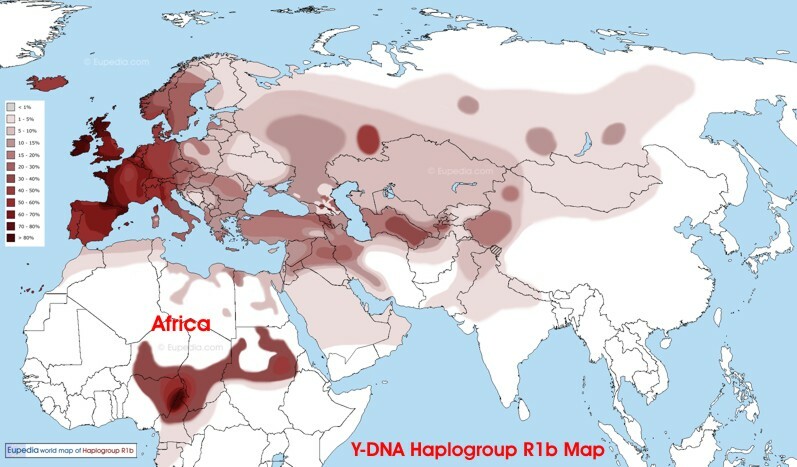 As a footnote, many people associate Y-DNA type R1a with the proto-Indo-Europeans. 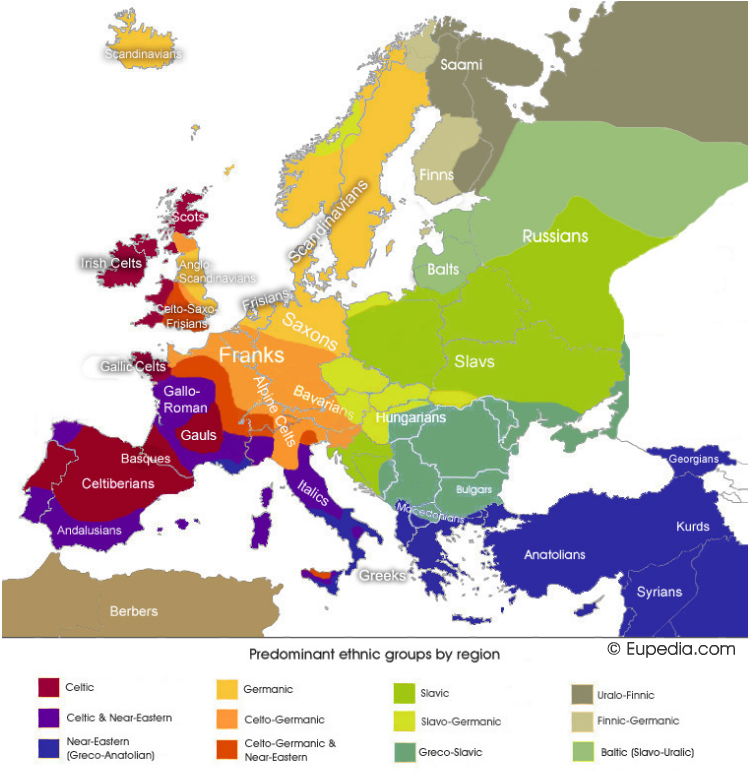 The association shows up in India (it is most common in high caste Indo-European language speakers), but I doubt that R1a is specific to Indo-Europeans in Europe. More likely, R1b and R1a constitute two different wings of the early Neolithic farmers that brough the Near Eastern agricultural package to Europe. R1a is a fit to the Linear Pottery culture and its cultural descendants that brought agriculture up from the Balkans through the river basins of Eastern Europe and expanded to towards Central Europe from there; while R1b, the Atlantic modal haplotype, is a fit to the early Neolithic population that expanded along the Mediterranean and Atlantic coasts associated with the Corded Ware culture and its successors and also with the megalithic structures seen in the Atlantic area. 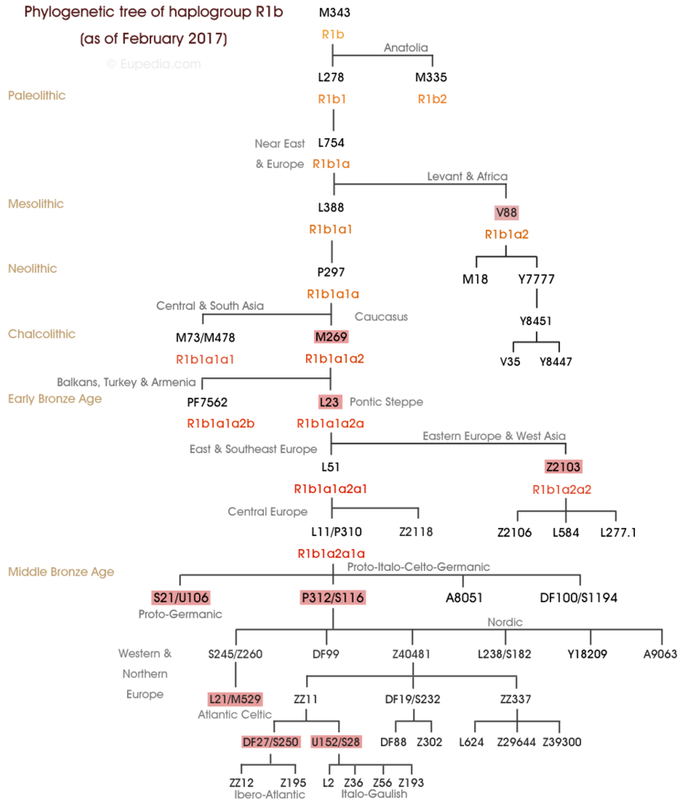 In my view, as expressed in my previous previous post, the Indo-Europeans, whose defining genetic tell is the Anatolian J2 haplotype (a good argument for an Anatolian or Caucasian homeland for the Indo-Europeans rather than a Balkan or Central Asian one, by the way), came much later. R1a, in contrast in my view, is likely to be a haplotype associated was a pre-Indo-European farmers who may have either turned to herding when they reached Central Asia (herding emerges contemporaneously with the emergence of farming, unlike hunter-gatherer lifestyles which far precede both), or may have been a deeper substrate of the farming population to which which J2 people (associated with origins in Mesopotamia and Anatolia) were added later on, that merged into the proto-Indo-European peoples not long before they entered India. So the north Cameroon people are closer related to Celts than Celts are to Russians? The earliest known back migration of R1b was from Asia to Africa and took place around 15,000 years ago. A group of R1b1* people moving from the Levant to Egypt, Sudan and spreading in different directions inside Africa to Rwanda, South Africa, Namibia, Angola, Congo, Gabon, Equatorial Guinea, Cameroon, Nigeria, Ivory Coast, Guinea-Bissau. The hotspot is Cameroon. 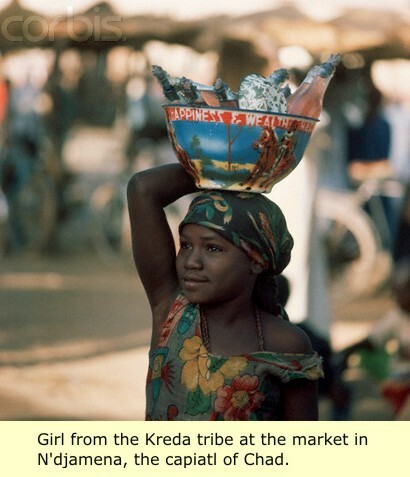 R1b1* was observed at a frequency of up to 95% in some tribes of northern Cameroon (like the Kirdi), and about 15% nationwide. It is in all likelihood where the early R1b people first settled, then spread south and east along the coast. 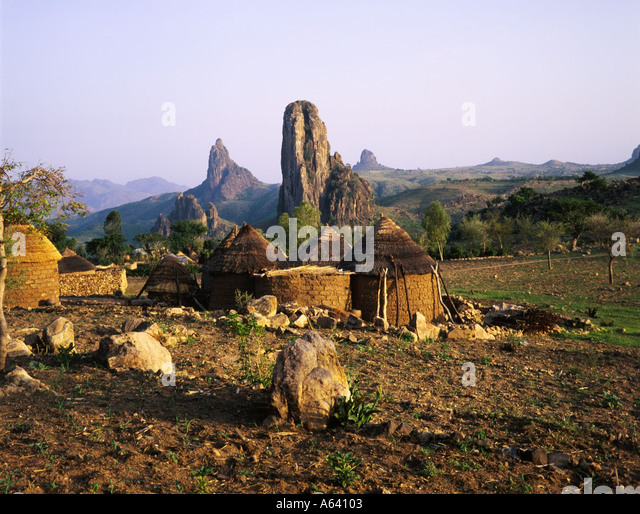 RE: The Cetic-like people (R1b DNA) of north Cameroon? (03-10-2016 01:41 PM)Rako Wrote: So the north Cameroon people are closer related to Celts than Celts are to Russians? damn negros are that far from samoans? i thought they'd be closer due to hair, skin and athleticism. Visually, Tongas are negroer. Samoans look more Asian than black. Quote: Ancient Egypt’s Lost Legacy? 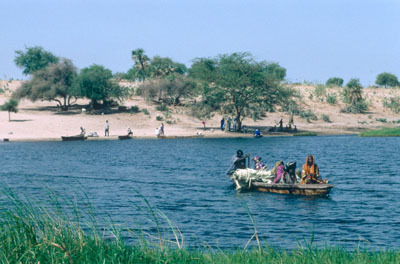 kilometers to the west of the Egypt (15), less than two months by donkey caravan from the similar environment of the Nile River. The Abu Ballas Trailacross the Sahara (12, 17) connects these two regions. instruments and Afroasiatic language roots. across the central Sahara into the Chad Basin. or cattle to across what is now the Sahara desert. in the Nile Valley). 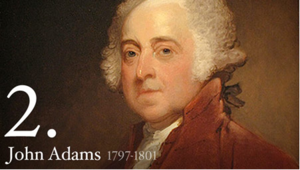 If so, they predated dynastic Egypt. DNA... the human genome... all social constructs. all in your head. you can be whatever race you identify with. The older fellow taking the oath above the map bears a striking resemblance to my uncle Dafydd Cadoc Llywelyn ap Morgan of Abergavenny. Except he's lacking, you know, the red hair and freckles. Uncanny, really! (03-10-2016 10:45 PM)Megatherium Wrote: The older fellow taking the oath above the map bears a striking resemblance to my uncle Dafydd Cadoc Llywelyn ap Morgan of Abergavenny. I used him because he does look to me like a black skinned version of a curly haired relative of mine who is found to be R1B. The cranium has similar shape. 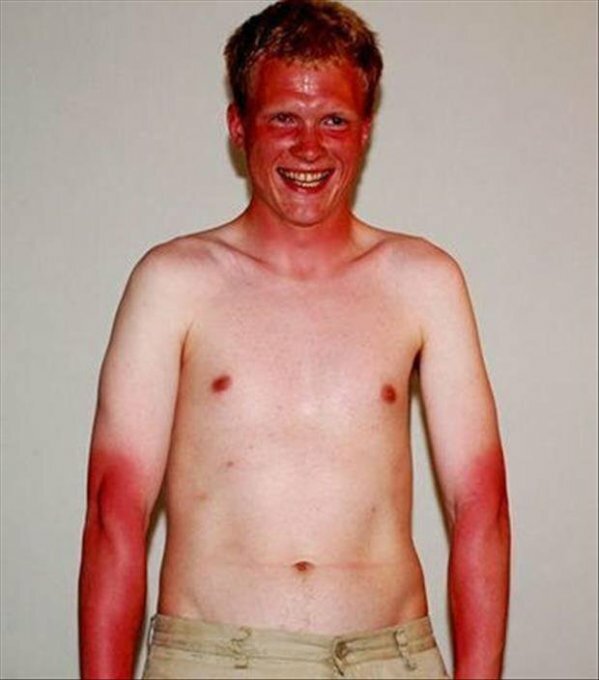 When you are in the desert for 10,000 years, supposedly over generations he skin gets darker. If you just change the desert skin color, the person' physionomy looks interchangeable to me. This is all afrocentric trying to force the false belief that life started from blacks in Africa. The high amount of R1b in Cameroon is quite strange for me to understand. The remains of a boy of haplogroup "R", called MAL'TA BOY, was found near Lake Baikal from thousands of years ago. The lands inhabited by people with R1 and R2 DNA seem to border each other in Norther India. R1-M DNA is found in Canada, while R1A and R1B are found in Europe and Russia and Central Asia. 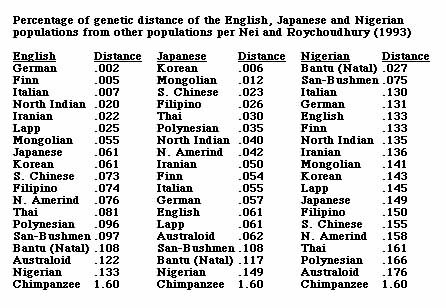 All of these facts would suggest that the homeland of R1 DNA is in Central Asia, Russia or Siberia. And yet somehow we have the colony of R1B DNA in Cameroon where the people seem to look a lot like other Subsaharan Africans. We report genome-wide ancient DNA from 44 ancient Near Easterners ranging in time between ~12,000-1,400 BCE, from Natufian hunter-gatherers to Bronze Age farmers. We show that the earliest populations of the Near East derived around half their ancestry from a 'Basal Eurasian' lineage that had little if any Neanderthal admixture and that separated from other non-African lineages prior to their separation from each other. The first farmers of the southern Levant (Israel and Jordan) and Zagros Mountains (Iran) were strongly genetically differentiated, and each descended from local hunter-gatherers. By the time of the Bronze Age, these two populations and Anatolian-related farmers had mixed with each other and with the hunter-gatherers of Europe to drastically reduce genetic differentiation. 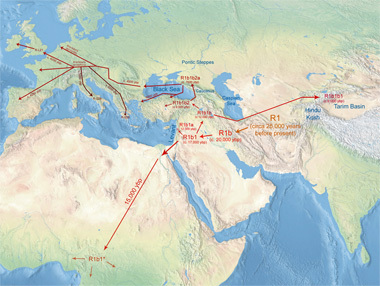 The impact of the Near Eastern farmers extended beyond the Near East: farmers related to those of Anatolia spread westward into Europe; farmers related to those of the Levant spread southward into East Africa; farmers related to those from Iran spread northward into the Eurasian steppe; and people related to both the early farmers of Iran and to the pastoralists of the Eurasian steppe spread eastward into South Asia. (03-11-2016 07:57 AM)Billygoat Wrote: This is all afrocentric trying to force the false belief that life started from blacks in Africa. Boom. Trying to convince western Europeans "Its all natural, what is happening." If you want a real scare, do some research into African languages.